Ten years later we had the unfortunate answer to this question. 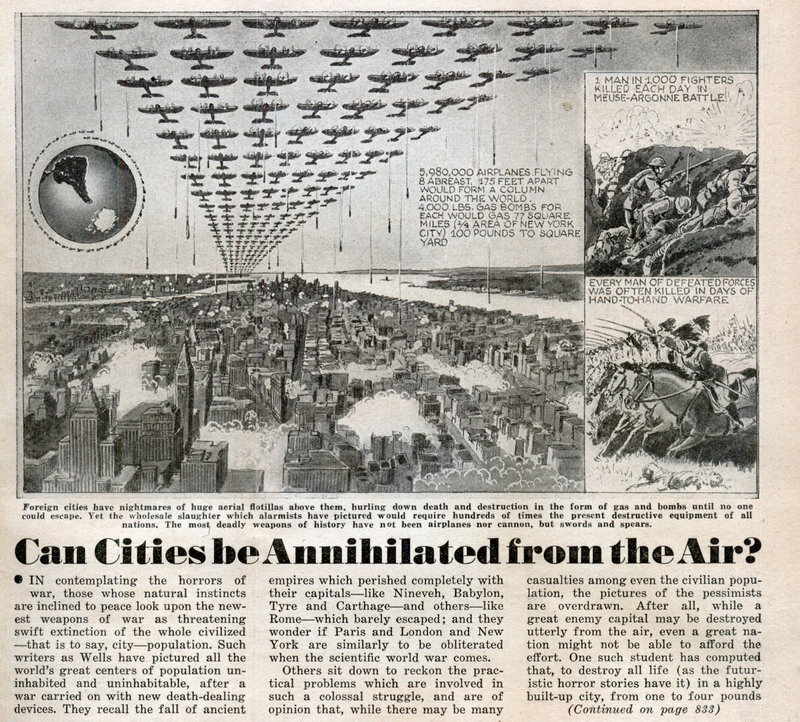 Can Cities be Annihilated from the Air? IN contemplating the horrors of war, those whose natural instincts are inclined to peace look upon the newest weapons of war as threatening swift extinction of the whole civilized â€”that is to say, cityâ€”population. 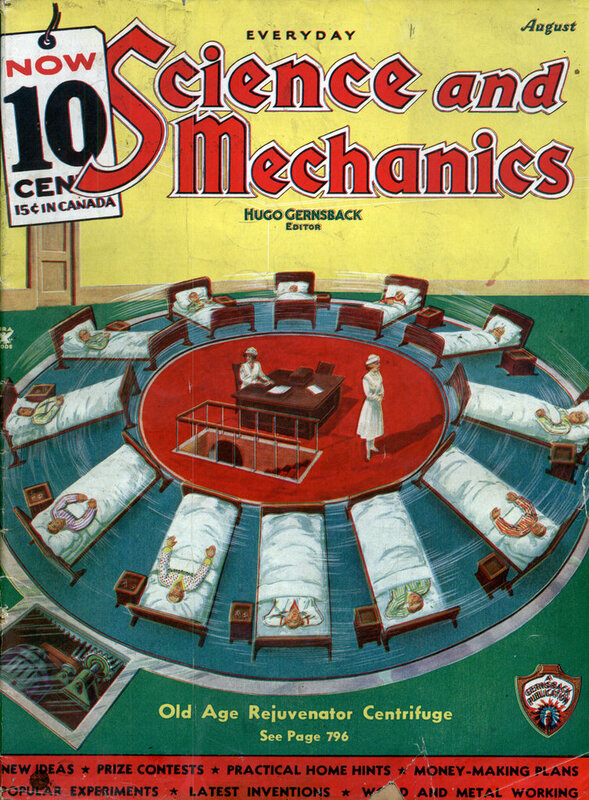 Such writers as Wells have pictured all the world’s great centers of population uninhabited and uninhabitable, after a war carried on with new death-dealing devices. They recall the fall of ancient empires which perished completely with their capitalsâ€”like Nineveh, Babylon, Tyre and Carthageâ€”and othersâ€”like Romeâ€”which barely escaped; and they wonder if Paris and London and New York are similarly to be obliterated when the scientific world war comes. Others sit down to reckon the practical problems which are involved in such a colossal struggle, and are of opinion that, while there may be many casualties among even the civilian population, the pictures of the pessimists are overdrawn. After all, while a great enemy capital may be destroyed utterly from the air, even a great nation might not be able to afford the effort. One such student has computed that, to destroy all life (as the futuristic horror stories have it) in a highly built-up city, from one to four pounds of gas is required for each square yard. (Poison gas is very heavy, and does not rise far from the ground.) To pour it upon the whole populated area of New York would require a stupendous weightâ€”an enormous production of chemicals, and a fleet of planes as numerous as the passenger pigeons of pioneer days, which flew in clouds. Modern war is even more costly than it is fatal. Genghis Khan, in the thirteenth century, destroyed perhaps more people than were killed in the late World War; but he did it with bows and arrows, swords and spears, at practically no expense. He did not leave the world saddled with war debts. In the old days, a city might be taken by assault; every person who was not killed on the spot was sold as a slave in foreign parts, and the site of the city was sowed with salt and made desolate. Whole populations, who certainly deserved survival (like the Numantians of Spain) for their heroism, were utterly extirpated; but no such wholesale destruction has been effected by modern bombardments. Nowadays, tons of shot and shell and gas are needed to kill one man (woman or child) at long range. Perhaps nations are not too highly civilized to kill each other off as they did one, two or ten thousand years ago; but war is getting too expensive to carry on, even with modern machinery. How can anyone forget the most destructive bobbing raid of all time, when the city of Dresden was almost wiped from the face of the earth. People in 1935 had little clue what was in store for them in a few short years. They could not imagine a fleet of a thousand planes each carrying five tons of bombs attacking a city. Still the attack on Dresden only killed about half the population of the city. This was accomplished by spacing the raids apart. Ten years later, one didn’t even need to deploy 1000 airplanes.